This attractive ceiling light has three undulated lampshades and a total of six lamps provide harmonious lighting. While the two outer elements are located on one side, the middle lampshade breaks extends to the other side and thus contributes to the contrasting appearance of the ceiling light. The aluminium frame is chrome-plated and impresses with its glossy surface, which is an elegant highlight in rooms of various styles. 6 quality LEDs with a luminous colour of 2,700 Kelvin produce warm white light whilst consuming very little energy. This ceiling light can be fitted in many different ways and blends perfectly in almost any room. 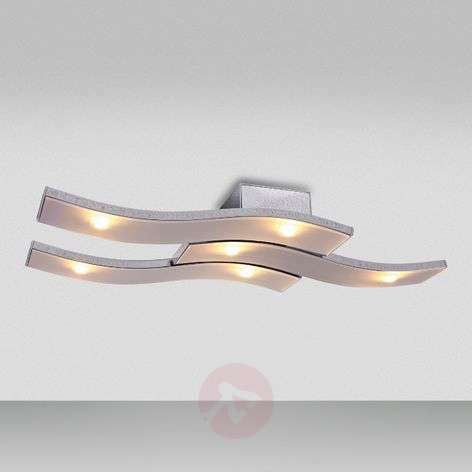 A special feature of the Cascade LED ceiling light is its sophisticated Bluetooth function. The light can be easily operated from afar via a smartphone or tablet - it can be switched on and off as well as dimmed. You only need to install and open the Casambi app on the respective device. If the smartphone is located in another room then the traditional light switch can be used to turn the light on or off as well as to dim it. The built-in memory function is particularly practical. This means that the last setting is always stored when the ceiling light is switched off. The next time the light is turned on it is automatically set to the previously selected brightness level. The manufacturer of BOPP wasn’t awarded the quality "Made in Germany" without a good reason. The company, which is based in the Odenwald, produces various types of light fittings for different living spaces since 1912. The craftsmanship and high quality standards, as well as strict quality control processes, guarantee products which provide a high level of customer satisfaction.